A deadly combination of veteran strength and new faces helped the Alumni defending champions reach their fourth successive JMU Journalism World Cup Final following a devastating 6-1 defeat of Level 2. 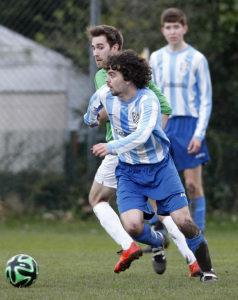 Goals by 50-year-old Jeff McGlinchey and two for John Mathews, 47, were supplemented by another brace from Adam Jones and a strike by fellow Alumni debutant, Tom Broughton, as the second years succumbed to the same opponents who shattered their dreams at this stage last year. Andy Cook’s header at the other end offered little consolation for Level 2, who fought well but could not stem the tide of the Green Machine’s onslaught. For the second years, there may well be a trace of injustice after having a huge penalty turned down by referee Danny Moxon when the game was still scoreless, despite Alumni captain Chris Shaw appearing to handle the ball with not one but both of his arms. In reality, however, the title holders were full value for their emphatic win, and it was something of a surprise that they were only one up following a dominant first half as dusk descended on IM Marsh. Sent forward for a promising free-kick, silver-haired defender McGlinchey deftly and decisively glanced in the opener with his forehead to convert Broughton’s guided missile of a delivery shortly before half-time. Level 2 skipper Josh Doherty and midfield colleague Josh Hodge were tireless in their attempts to make inroads for the underdogs, but they were left deeply frustrated as the goals started to rain in after the interval. Class of 2008 graduate, John Mathews Junior (no relation), watched his thunderbolt shot hit the crossbar before the Alumni started to pull clear. 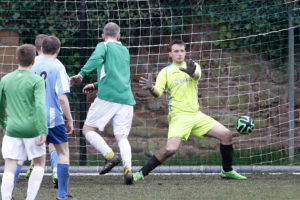 A succession of corners ended with the second years’ otherwise impressive goalkeeper, Tom Begbie, spilling Gary Maiden’s delivery and, after a frantic scramble, Broughton kept his head to drill in the second. Gaz Top then flicked a teasing pass into the path of impact substitute Mathews, and the lecturer elegantly chipped the helpless Begbie to score with his very first touch after bringing himself off the bench. A flicker of promise emerged when the Level 2 keeper’s cousin, Andrew Begbie, broke free and crashed his drive against bar, with Cook quick to react as he nodded in the rebound to reduce the deficit to 3-1. Detecting a change in fortunes – and fully aware of the Alumni’s capacity to collapse at the first sign of looking as if they might win – the second years pressed hard as the cup holders seemed distinctly and characteristically nervous. Those comeback hopes were quickly extinguished, though, as Level 2’s James Jones handled in the area and player-manager Mathews made no mistake from the resulting penalty. Jones’ opposing namesake, Adam, who was drafted into the Alumni squad this year after failing to taste victory in any of his previous outings while still a student, then put the result far beyond doubt with a late double. 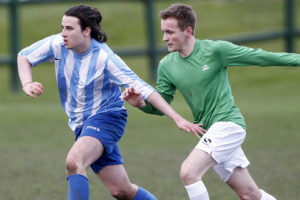 Showing remarkable composure, Jones raced through twice in the closing stages to take on and beat Begbie to net the Alumni’s fifth and sixth on the night to seal their place in the showpiece finale once again, with only the first years now standing in their way of back-to-back triumphs.